Mobility, compatiblity, and portability are what define the technology of our times. We prefer things that can easily travel along with us and are easy to fit in everywhere. That is why we replaced desktops with laptops, telephones with mobile phones and offices with home. Now, the last one doesn’t make much sense for most people. Yet, it is quite true now. Due to the recession, inflation and lowering pay-scales, people are turning towards home based jobs. A home based job has many benefits, but you must dedicate a place in your home for your work and office furniture. Most of the time all you need for your home office is a computer, printer and fax machine, but you need somewhere to store them away from all the hustle bustle of the day, somewhere calm, quite and away from the reach of children and pets. 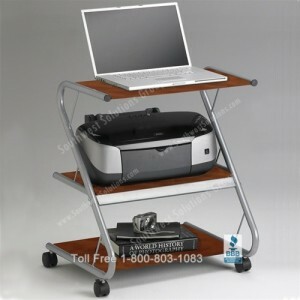 At home or in small offices, mobility becomes important. Did you know you are able to move your workstation? 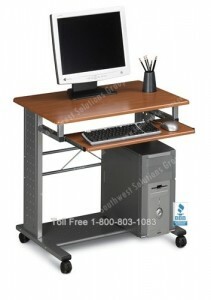 StoreMoreStore offers a number of home office furniture solutions for you.We have laptop workstations, mobile computer carts, laptop caddy’s, rolling filing cabinets, space saving desks and more! One of our favorites is the Latte Rotary PC Desk with Credenza. The Latte Rotary PC Desk with Credenza is a complete mobile work station for your home office. The desk actually swings over the credenza for storage when not in use, saving you a lot of space when you are not working. The credenza has multiple features such as a slide out printer shelf, box-file drawer pedestal and even a space to place your CPU. 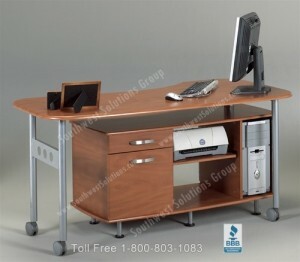 The sleek design and color options makes this a great office furniture solution for those concerned with aesthetics. The edges of the Latte Rotary PC Desk with Credenza are seamless and contoured using vacuum-formed thermofoil technology. Perfect for that home office with children since there are no sharp corners to contend with. 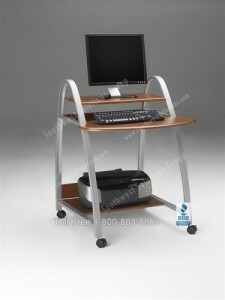 So, it is a perfectly compatible, movable and space saving furniture solution for your home or small business office. 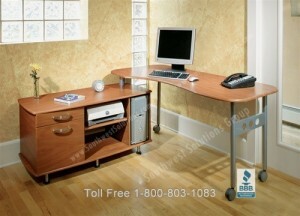 Please see all of our home and small office furniture solutions at www.StoreMoreStore.com!